Voorverkoop is gestart op vrijdag 22 maart 2019. Ahu ahu, wild moon child.. In little more than one month we shall return to our lunar celebration Wild as the Moon. During this easter weekend we touch the Friday for the first time to honour the full moon. And after the mindblowing edition with Damian Lazarus, The Soul Brothers and Rico Loop we are extremely excited to present you the upcoming program. Flying Circus was developed by the Audiofly duo Anthony Middleton and Luca Saporito. A concept that is more than a single event. It is a lifestyle, a mindset, a dream, a moment, an encounter, a memorable dance. An experience. 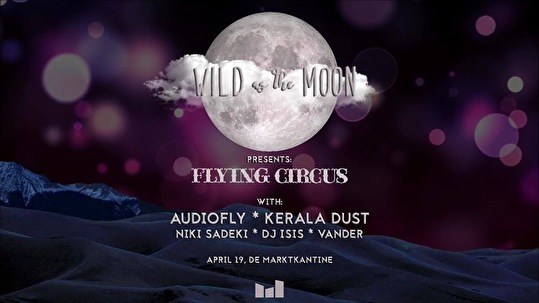 Since 2006 Flying Circus has united us on the dance floor, in a memorable experience powered by the highest levels of musicality. Wild as the Moon starts every show with a powerful moon meditation. By allowing yourself to "arrive", you enter a new dimension. Together, we take a moment to get used to the energy around us. To step away from the outside world and into the new world. Conscious, mindful and aware. Let the words and music guide you to the ethereal planes and find out more about yourself.